Transportation of fish should be very effective for proper distribution of fishes to the consumers. 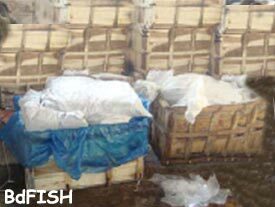 It is an important aspect of fisheries as both live and preserved fishes can be transported from one place to another as per requirements. 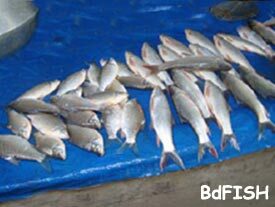 In Bangladesh everyday huge number of fisheries items are being caught both from inland and marine water resources. But lack of proper preservation and transportation facilities, a noticeable amount of fishes are either damaged or spoiled losing their quality. For proper transportation, suitable containers and transporters (fish carrying vehicles) are essential to ensure quality product. The quality of fish highly depends on these two factors. 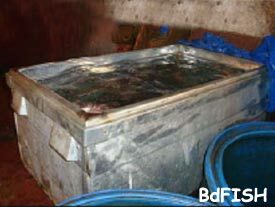 Different types of containers and vehicles are used for marketing of fishes in different fish markets of Rajshahi City Corporation area. The important fish markets under Rajshahi City Corporation are given bellow. 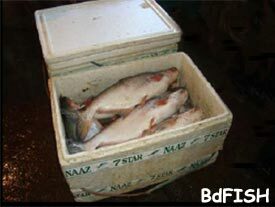 Various types of containers were observed in the visited fish markets. 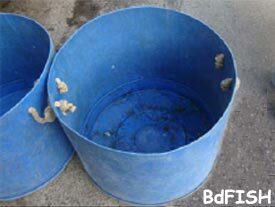 These containers are used for holding fish during transportation or for selling the fish. The details of containers are described here. Use: Usually for holding live fish especially for live carps. Use: For holding live fish especially for live carps and catfishes. Use: For holding live fish and sometimes dead fish especially for live carps and catfishes. 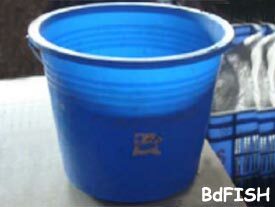 Use: For holding both live and dead fish including carps especially small indigenous species of fishes (SIS fishes) etc. 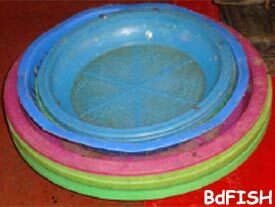 Use: For keeping dead fish including carps, small indigenous species etc and live air breathing fish like shing, magur etc. 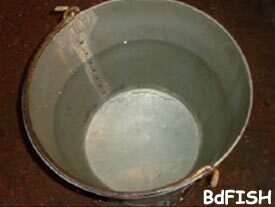 Use: For keeping small live fish, mainly used for holding water for washing. 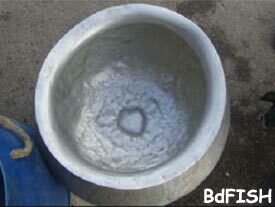 Use: For keeping both live and dead fish including carps, small indigenous species etc. 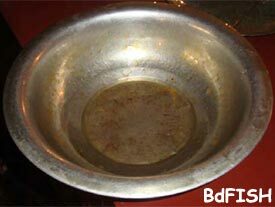 Also used for holding water for washing. Use: For holding live fish, especially for live carps. Use: For keeping live fish including carps and catfishes. Use: For holding fish especially during transportation. Use: Mainly for holding water to wash fish. Use: For holding fish during transportation and in markets. 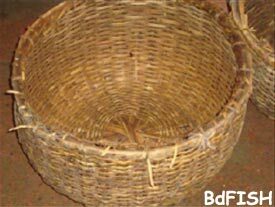 Polythene sheets or banana leaves are used with this basket. 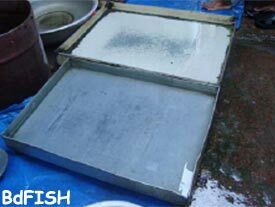 Polythene and plastic sheets both are used in transporting of live and dead fish. These materials also used in fish markets for keeping fish on it. 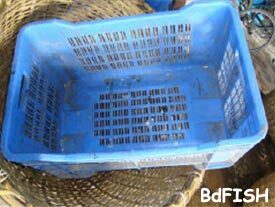 In case of live fish transportation in bamboo basket, these materials are used for holding water. Banana leaves are very common materials used in the observed fish markets. Usually the leaves are used with bamboo basket for holding fish preserved by icing. Poor physical conditions of the containers. 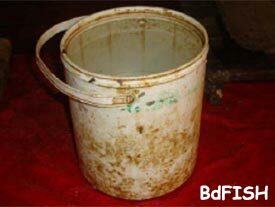 Use of dirty or un-cleaned containers. 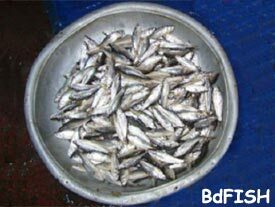 Overloading of fish in containers. DoF. 2006. Brief on Department of Fisheries Bangladesh. Department of Fisheries (DoF), Ministry o Fisheries and Livestock, Dhaka. Shammi, Q. J. and S. Bhatnagar. 2002. Applied Fisheries, Updesh Purohit for Agrobios (India), Jadhpur, India, 137pp. Visited 1,838 times, 1 visits today | Have any fisheries relevant question?